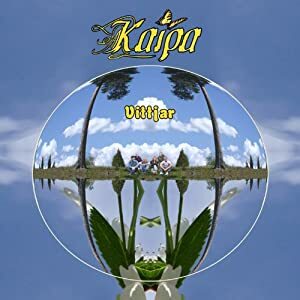 Share the post "KAIPA – “VITTJAR”"
It feels very strange to be reviewing a band which released its debut effort around the same year you were born but this is indeed the link between me and the Swedish Prog Rockers Kaipa. Following an extended ‘break’ between 1982-2002, during which both the founding guitarist/vocalist Hans Lundin and his co-conspirators each followed their own musical paths, the band returned stronger than even (even though guitar wizard Roine Stolt of The Flower Kings is no longer in the picture) and they continue to surprise and amaze their loyal fans with a string of good quality albums, the latest of which is entitled “Vittjar”. Being a massive fan of The Flower Kings and knowing next to nothing about Kaipa’s material may seem an unforgiveable sin, however, I decided to overcome this small hurdle and applied myself to the task at hand. You only really need to spend a few minutes in the company of “Vittjar” to realise how many things this eight track release has in common with any of The Flower Kings’ albums! Melody plays a prominent role as it not only constitutes the backbone of every composition, but also connects long technical/experimental sessions – sessions that are performed by every single instrumentalist in the band. As a result, even though “Vittjar” contains compositions of ten minutes or more on average, the music here is miraculously both pleasant and digestible, thereby ensuring a wide audience for this impressive outfit. The album kicks off with the keyboard/bass led folky tunes of the short instrumental piece “First Distraction” and truly flourishes with “Lightblue And Green” – a twelve minute exercise in technical dexterity which also finds the band investing in some beautiful violin/acoustic guitar melodies and ethereal female vocals, courtesy of Ms. Aleena Gibson. If, by then, you think you have survived the band’s experimental tensions then the twenty two and a half (!) minute opus “Our Silent Ballroom Band” is here to prove you wrong, featuring more stunning melodies and elongated themes of Dream Theater-orientated experimental madness. The bass-led, Swedish sung “Vittjar” is quite a simple track by comparison and perhaps provides a welcome break to the faint-hearted, while the truly inspirational “Treasure-House” adds a touch of reggae to the proceedings. “A Universe Of Tinyness” brings the Berlin rockers City and their magnum opus “Am Fenster” to mind and that is mainly why I consider this to be the highlight of the album. Continuous manipulation of rhythm and strong focus on melody are also the main ingredients of “The Crowned Hillsides”, while similarities between the melodies of “Second Distration” and those of the opening track provide the album with a feeling of having come full-circle. Those among you who suffer panic attacks when faced with protracted technically-infused compositions may feel that “Vittjar” is not the album for you, but you couldn’t be more wrong! What’s truly great about the eight compositions of this album is that they are as much challenging as they are accessible, satisfying both the typical Prog Rock fan but also people who like their Rock to be more straight forward and melody-driven. It was only a few weeks ago that Roine Stolt unleashed upon the world yet another top quality The Flower Kings album and already his ex-colleagues are here to prove to him that competition is not only fierce but closer to home than he might think. This entry was posted in ALBUM REVIEWS, ALBUM REVIEWS (Mobile), All Posts, PURE METAL (All posts), Pure Metal/Album reviews. Bookmark the permalink.